I know I mentioned last week that News & Notes would appear on Fridays, but I had a brain cramp and forgot that tomorrow is a getaway day for the holiday weekend. So, I'll shoot for Fridays starting next week. By the way, you can now follow Gluten Free Philly on Twitter @gfphilly. Lots of serious - er, cereal - news this past week. On Saturday, I wrote that General Mills removed oats from original Kix and on Monday, I reported on a new General Mills cereal - Sprinkles Cookie Crisp - that contains no WBRO (wheat, barley, rye or oats) ingredients. Incidentally, an article in the Marketplace section of today's Wall Street Journal describes General Mills' recent development and marketing of gluten-free products. On Sunday, I posted information about a Blackwood, New Jersey company, Caesar's Pasta, that sells a variety of gluten-free Italian frozen entrees in area grocery and health food stores. I added five restaurants this week to the gluten free-friendly restaurant list, including Sweet Christine's Gluten Free Confections in Kennett Square, Pennsylvania. In addition to offering lots of gluten-free baked goods, Sweet Christine's has a breakfast and lunch menu that includes salads and sandwiches. The premises are 100 percent gluten free. Also new this week are the Greenhouse Cafe in Long Beach Island, New Jersey, the Bashful Banana Cafe in Ocean City, New Jersey, Bistro La Minette in Philadelphia, and Margaret Kuo's in Wayne, Pennsylvania. The general manager at Margaret Kuo's says that most menu items can be prepared gluten free using an organic, wheat-free soy sauce. The owners of A Cupcake Wonderland, which is listed on the gluten free-friendly bakery list, shared with me some more information about their company. The gluten-free cupcakes they offer are made separately by AllerJennie's Baked Goods. Jennie, who specializes in making allergen-free desserts, deep-cleans all the equipment and uses separate utensils in preparing gluten-free mixes. She uses the following flours, grains and ingredients: arrowroot, cream of tartar, baking soda, quinoa flour, chickpea flour, rice (brown and white) flour, sorghum flour, tapioca flour, potato starch, agave, maple syrup, canola oil and vanilla. The ladies of A Cupcake Wonderland decorate the cupcakes with gluten-free frosting and candies. Two weeks ago, I mentioned that West Philadelphia bar Local 44 is serving New Grist gluten-free beer from Lakefront Brewery. Reader Sonya tells me that the bar has carried other celiac-friendly beers in the past and will rotate its gluten-free beer options. Back in March, I mentioned that gluten-free foods would be available for Phillies games at Citizens Bank Park this season. The team recently updated the concessions guide on its website to list the locations where the items can be found: the gluten-free hot dogs and snacks continue to be available at the South Philadelphia Market behind Section 128, while Redbridge beer is sold at the concession stand by Section 139 (near the Schmitter), behind Section 204 on the Pavilion Level, behind Section 323 on the Terrace Level, and the Brewerytown stand on Ashburn Alley. In addition, Bull's BBQ in Ashburn Alley, run by former Phils outfielder Greg "The Bull" Luzinski, has gluten-free food. The meat products, barbeque sauce, cole slaw and beans are gluten free. Since sandwiches are sold at that stand, I suggest checking it out first to see if there's a risk of cross-contamination. Speaking of the Phillies, tickets are still available for celiac awareness night at the team's game against the Chicago Cubs on Monday, July 20. Group tickets are located on the Pavilion (Sections 206-208) and the Pavilion Deck (Sections 307-308). Proceeds from ticket sales will support raising celiac awareness and funds for research. Discounted tickets are available by phone at (215) 463-5000 ext. 5111 or through the Phillies website using the promotion code CELIAC. More on cereals: Erewhon recently added two more gluten-free cereals to its lineup. New are Cocoa Crispy Brown Rice and Strawberry Crisp. 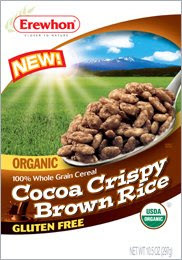 Both cereals are certified organic and have no artificial colors, flavors or preservatives. Erewhon cereals are available at area Whole Foods, Wegmans and natural food stores and online at Amazon.com. The Reading, Pennsylvania chapter of Raising Our Celiac Kids (R.O.C.K.) will host a "Summer Fun" event on Saturday, July 18. The gathering will be held from 2 p.m. to 4 p.m. at the West Lawn United Methodist Church at 15 Woodside Avenue in West Lawn, Pennsylvania. Finally, reader Ramona wrote to tell me that Knoebels Amusement Resort, within a few hours' driving distance of the Delaware Valley in central Pennsylvania, has gluten-free food available. Grilled chicken, hot dogs, hamburgers, salads and tacos are among the safe options, according to the resort's Guest Relations. Have a great Independence Day weekend - happy birthday America! This is a much needed site for the Phila. & surrounding areas! I am going to post a link on my site for folks and make sure my oldest daughter has this site as well! :) This will make it so much easier when I want to take the family out to eat. Great Job!